The shofar (ram’s horn) is the biblical trumpet (the Hebrew word shofar is translated “trumpet” in most English Bibles). Because the most ancient shofar was made from a ram’s horn, it reminded the people of the ram that God provided when Abraham offered his son Isaac on Mount Moriah. Because shofars can be made of any animal horn except that of a cow, a much larger shofar is made from the horn of an antelope, and is called the Yemenite shofar. 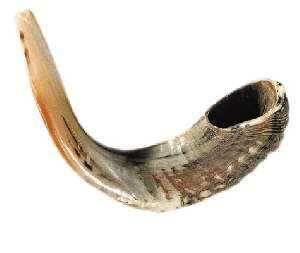 The shofar is a very important element in the worship experience of the Jewish community. It also has great significance for Christians, for the references in the Apostolic Scriptures to the trumpet most certainly refer to the shofar. When John spoke of seven trumpets in Revelation and when Paul wrote about the last trumpet that signals the resurrection, they were talking about the shofar.